Do you have a child in fourth grade this school year? (I do!) If so, you’ll want to know about this program! 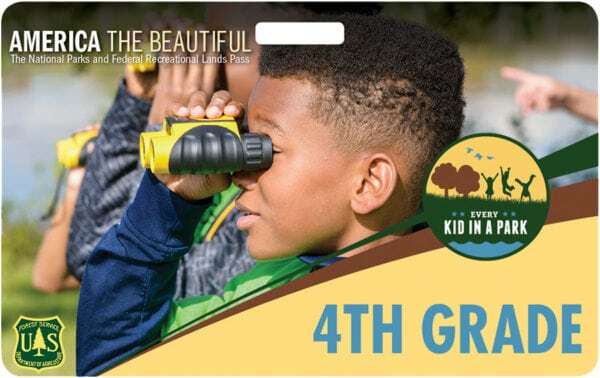 Every Kid In A Park offers a FREE annual pass to all National Park Service Federal Lands and Waters for 4th graders and their families. You can explore dozens of places with no entry cost to you! * Show your pass to a ranger when you enter. If there is no ranger, leave it on the dashboard of your car. * If you visit a site that charges entrance fees per person – The pass admits all children under 16 and up to three adults for free. * If your group visits a site that charges vehicle entrance fees – The pass admits all children under 16 and all adults in up to one passenger vehicle. Commercial vehicles can’t use a pass to get in. * If you arrive at a site on bicycle – The pass admits all children under 16 and up to three adults on bicycles. * The pass doesn’t cover things like parking fees, camping, boats, and special tours. Also, some sites are managed by private operators. They may not honor the pass. Check with the site ahead of time to find out. * The pass doesn’t cover fees for local, city, or state parks and recreation areas unless they say that they accept this pass. * Paper passes can be exchanged for plastic passes at certain sites. Basically, you will want to call ahead to where you are planning to visit to make sure you are covered completely and if not, what you will need to bring with you. Get started HERE. * The pass is for U.S. fourth-grade (or home-school equivalent) students. * The pass is for the 2018 to 2019 school year. It expires August 31, 2019. * Students can’t transfer the pass to anyone else. * We can’t accept electronic versions of this paper for access or to exchange for a pass. * No refunds are given for previously purchased passes, or if you forget your pass when you visit. * If you lose your pass, get a new one by visiting the website and signing up again. * Educators can get one paper pass for each of their fourth-grade students. * This program only provides passes for fourth graders. What’s stopping you from visiting everything you possibly can now? This would be amazing for learning and growing our young minds! This is fantastic! I hope many families take advantage and get outdoors! What an awesome program! Hope they still have it when my daughter is in 4th grade. I wish I was a fourth grader! Fourth graders get all the breaks, lol. Thanks for posting! This is a great idea. I hope that alot of kids take advantage of this pass.